You can tell from his intensity and his bearing that he means it too. Kelson "Mac" Poepoe was the man who first proposed that small fishing communities in Hawai`i come together to share traditional practices that had ensured a bountiful supply of fish over generations past. That suggestion, prompted by the worrying observation that the fish were not as plentiful as they had once been, led to the creation of E Alu Pū. 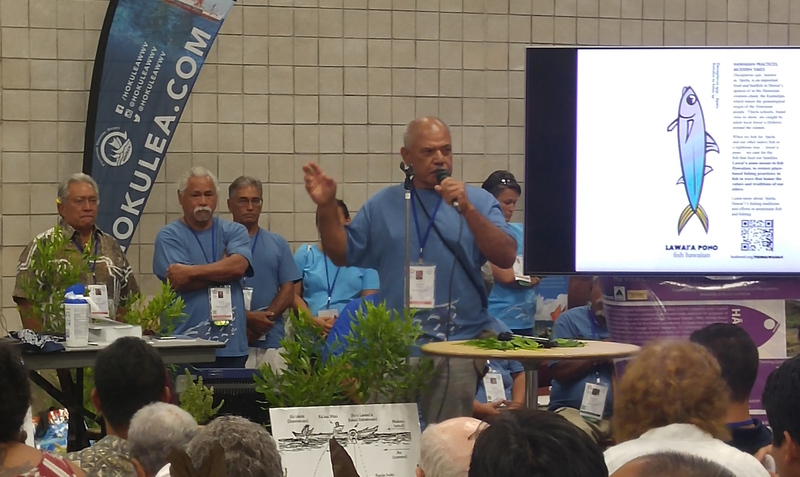 Representatives of some of the 30-plus small communities that make up the network came together to tell their story at the Hawai`i Pavilion of the IUCN World Conservation Congress in Honolulu this week. The oli that the group chanted before the speakers took to the microphone set the stage for the prayerful recounting of how tradition and ancestral fishing protocols have sustained these communities over the years. 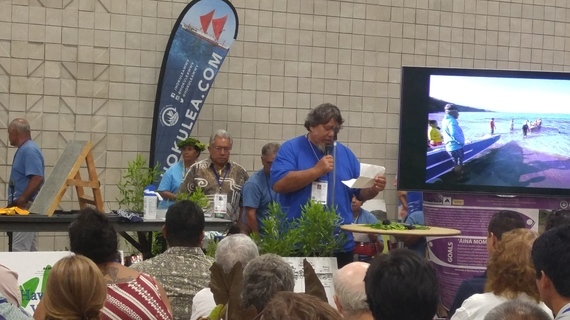 "We have to bring back those practices," said Uncle Mac, a designation that a fellow E Alu Pū member, Charles Young from Ho'okena, said reflected the deference everyone paid to Poepoe for the depth of his knowledge and his leadership. "I'm older than him, but I still call him Uncle Mac to show my respect," said Young. "It's not my knowledge. It's what has been handed down to me and which I am happy to pass on to the young people today, who will pass it on to their children. That connection makes me very proud," said Poepoe. He went on to observe that everyone likes to talk about how they want to "malama" (take care)of the 'āina. "Talking is not enough. We must all take small steps, pay attention to what nature tells us, and respect the sacredness of the ocean and its ways." To help people relearn old practices, Poepoe described the calendars that his community started and that others have since emulated, showing when not to catch certain fish because it was spawning time for these species. "So many of our problems have arisen because we have forgotten the old ways. We need to return to what used to work, that didn't need fixing." Damien Kenison of Hoʻokena, Hawaiʻi provided an emotional and heartfelt account of why he and his family are so proud and grateful to be part of the recovery of traditional fishing practices that had served the community so well in the past. 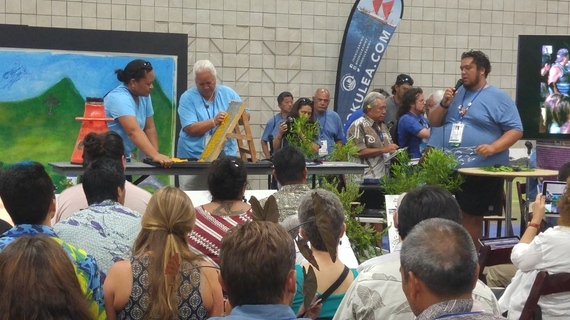 Teddy Blake from Kōloa, and Charles Young both pointed out in their remarks at the same session, that after the overthrow of the Hawaiian kingdom, Hawaiian values were disparaged. Hawaiians were made to feel that the old ways were inferior. Traditional ways of living that were mindful of the natural world were supplanted by Western notions of success: a formal education, getting a job in the city, buying a modern home. Leivallyn Kaʻupu and Kaʻimi Kaupiko from the fishing village of Miloliʻi explain to the audience, and Napua Barrows of Maui helps demonstrate how vegetables are grated to make palu (fish feed) to feed and care for their ōpelu (mackerel) fishing grounds (koʻa). "Today, thankfully, we are rediscovering our past and relearning what had been forgotten or set aside. Our children are pursuing advanced degrees and rediscovering their heritage," said Young. Uncle Mac ended his remarks by observing that these days people come to the ocean with all kinds of new toys for recreation. "And that's okay. But if members of the community that live there are fishing in the area, paddle your canoe somewhere else. As tourism has grown, other activities have superseded fishing. It's time that fishing supersedes everything else," he said. There was no mistaking his evangelizing zeal.